Two University of Newcastle researchers are among 37 new Fellows elected to the Australian Academy of Health and Medical Sciences (AAHMS) in recognition for their outstanding contributions to health and medical research. 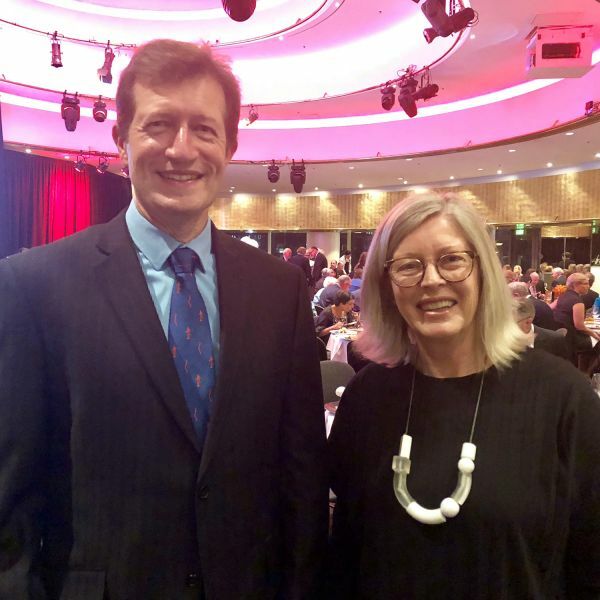 Internationally renowned clinical psychologist Professor Amanda Baker, and Conjoint Professor David Durrheim*, a leading public health researcher and advocate for immunisation, were admitted at the Academy’s fourth annual meeting last night. National Health and Medical Research Council (NHMRC) Senior Research Fellow at the University of Newcastle, Professor Baker, is breaking new ground specialising in the treatment of co-existing mental health and substance use problems. Professor Baker said she sees the AAHMS Fellowship as a way to contribute to mentoring young scientists and health care researchers. “Co-existing mental health problems and smoking, alcohol and drug use remain an enormous challenge. I hope to be able to influence the community and government in progressing this area of health,” Professor Baker said. Committed to improving immunisation services, disease surveillance and outbreak response methods in Australia and globally, Professor Durrheim is the Director of Health Protection, Hunter New England Health and Conjoint Professor at the University’s School of Medicine and Public Health. Professor Durrheim said it was a great honour to share Fellowship with many of Australia’s premier health and medical scientists. “The Academy not only serves to ensure that Australia remains a leader in public health research into the future, but also provides impartial and authoritative advice based on the best available evidence,” Professor Durrheim said. The University’s Acting Deputy Vice-Chancellor for Research and Innovation, Professor Brian Kelly, said he was proud to see Professor Durrheim and Professor Baker join the growing list of University of Newcastle researchers who have been elected to the Academy’s Fellowship. “The University is committed to high impact research that benefits communities in our regions locally and globally, and Fellowships such as these help to recognise such contributions to the medical field,” Professor Kelly said. Researching in conjunction with the Hunter Medical Research Institute (HMRI) Professor Baker and Professor Durrheim are among 37 new Fellows, bringing the Academy’s total Fellowship to 357. The Academy’s President, Professor Ian Frazer AC, said their diverse talents and expertise reflect the incredible breadth and depth of Australia’s world class health and medical research. “We work with our Fellows to strengthen the health and medical research landscape in Australia. It is thanks to their expertise that we can play a valuable role in ensuring that Australia continues to address some of the world’s most pressing health challenges,” Professor Frazer AC said. *Professor Durrheim is Director of Health Protection for Hunter New England Local Health District and leading researcher with the University of Newcastle and Hunter Medical Research Institute (HMRI). HMRI is a partnership between the University of Newcastle, Hunter New England Health and the community.